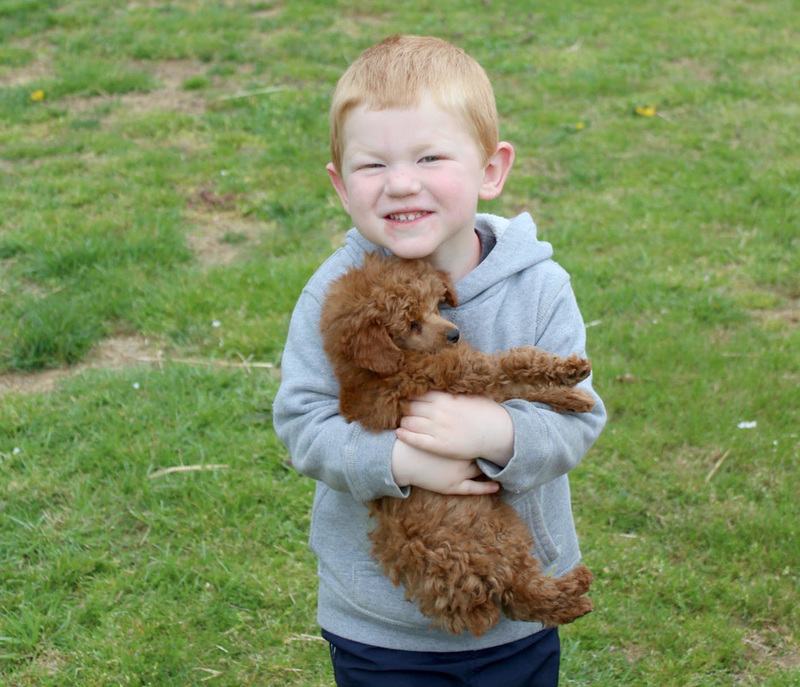 Here are pictures and notes from some of our puppy owners. We love hearing from you all - keep sending us your pictures and your letters. I don't always get time to put everyone up here, but I try to. :o) ​ Love you all. Zoey (in front) and Banjo live with Rachel in Alabama. Here is a nice note from Rachel. Zoey is doing so well for me! She weighed 3 lbs last week on the 18th. Thank you Jean for sending us your video - we are thankful for wonderful homes for our babies. Hi Mary Ann! Hope you had an amazing trip! Hope you are caught up on sleep too. I just had to tell you.....this guy was fixed on Tuesday and did so wonderful!! I was so worried about him but the vet said he did fantastic. He is just acting like nothing happened. The vet keeps saying what a great breeder you are. They always want to keep him!! I’m so attached to him and he’s just the best! Oh yes he is loved for sure! Always making us laugh and putting a huge smile on our faces! Thought I’d show you a picture of Samson after his first puppy groom today. :) We have a great place 25 min. away that we like. He is so fun. Also quite the people magnet at baseball games. I’ve given your name out several times. cute as can be and very smart. Sammy is eating much better, he weighs 3 lbs. and she is 4 lbs. I'll be sending the paper you requested back to you as soon as I get it signed and in the mail. ​It’s been great. I ended up naming her Rayna instead. I went ahead and changed her microchip to that name also. Hope you are doing good and glad you enjoyed your trip! Hi Mary ann, It has been awhile since we have been in touch but i thought you would like to hear that Dex is one of the best things to happen to me! He is definitely my best friend along he also loves my girlfriend to pieces. I take him on at least one 2 mile bike ride a day and he cannot get enough of it. I do not know if you have ever been to Twin Lakes dog park in Columbia, Missouri but we take him there at least 4 times a week and he makes new friends everytime. I have trained him to the best of my ability but i believe it might be smart to take him for a few classes. My girlfriend loves Dex so much she plans on getting one within the next couple years. With that said, she really wants a blue merle. 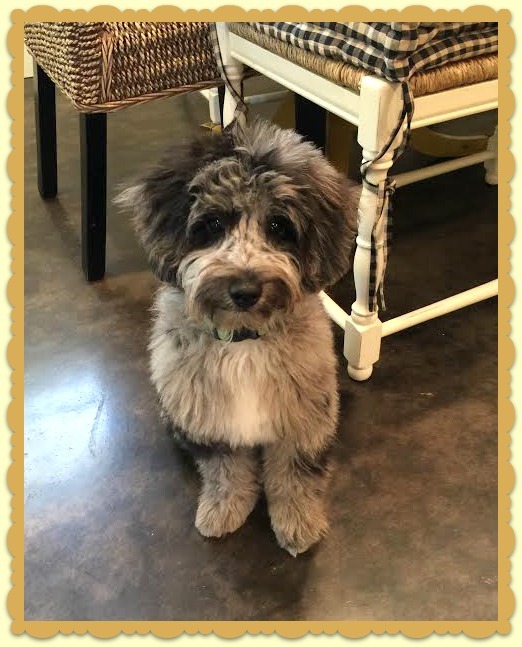 Do you breed that type of aussiedoodle? I will attach a few pictures of what she has in mind. Also I thought you would like the pictures of Dex over the last 5 months!!! Just a quick note on day one. Granted it's only one day, but Echo, by far, has been the "easiest" pup we've had. A real sweetheart, she is already picking up on the "go potty" phrase & will do her job quickly without too much putzing around and, knock on wood, we haven't had any accidents in the house for the 24 hours. Last night she pretty much slept through the night. Was a little restless around 2:30. Let her out, she went right away, and back to sleep with only a few whimpers. When we have things to do, she's content to be in her crate. This morning she had a blast playing with our 8.5 month old 25lb Poodle. They ran and ran, when Kona got a little to rough, Echo scooted under a chair for a moment, then off running again. Following an overnight rain & with the morning dew, Echo came in looking like she just had a bath. We've learned that Kona plays better if she has a toy in her mouth when running with Echo. If they keep this up, I think they'll be best buds. Don't know if Echo was a "grazer" taking her time eating, so far she's "semi interested" in eating - only finishing about 1/2 her recommended serving. Might just be all the change occurring in her life. I can easily see why you love this little girl. p.s. The health agreement is signed & I'll try to get it in the mail today." We had the snuggle puppy set & ready to go. Each of the last 2 nights she's gone to bed with very little fuss & has crashed after only a few minutes, so we haven't used it yet. After about 5 hours, she stirs a bit, we take her out, she does her business promptly, and back to bed - no problem. Thursday she was a bit fussy with food. Just took a good night's sleep, yesterday the appetite came back in full force. We did add unsweetened plain yogurt to her mix of food. The yogurt is a staple here for all our pups, we always have 2-3 quarts on hand. Went to the dog park this morning, it's leash free & fully fenced around the perimeter. We go 1st thing in the morning, park's hours start at 5 am - it's like having your own 20 acre backyard, we're the only ones there. Each dog has a flashtag light on their collar, with their own unique color so if they lag behind I can tell who it is. I have a headlamp that straps on top of my head. It has LED lights and can light up an area around 150-200 feet in front of us. The entire time Echo walked right by my side and once in a while ran after the other dogs chasing a thrown lighted ball. We were out for almost an hour and Echo didn't miss a beat. With the cool nights & heavy dew on the grass the pups come home looking like they just stepped out of a bath. They get dried off, relax a bit, then get breakfast. I'm still in disbelief that a 13 week old pup sleeps virtually the night through, hasn't had an accident in the house yet - even went to the door last night & cried to go out, she had to poop. I think she even knows her name already & comes when called. She's set to start puppy kindergarden next Thursday, with all she's learned in the couple of days she'll be a star. Welcome back home. Got both the tag & certificate along with everything else. I made a copy of the certificate plus the health record for our Vet. Between the 2 documents they have the complete set of records. All went well, she got a clean bill of health, and did not get another rabies shot. Everyone at the clinic fell in love with Echo. Last night we attended our 1st puppy kindergarten class. She's a champ. Even before class, she's been walking on lead without pulling (all 5 pups go at the same time without a fuss), learning to sit on command by both verbal & hand signal, will come when called, and while everyone was working on the sit command in class, I started to teach her "down." She's a bit shy during the socialization time, must be the new dogs - she's comfortable & a "social butterfly" around our little pack of 5. Echo wants to be friends with every one of our other 4 pups. Echo loves to rough-house & play relentlessly with Kona our 7 month 26 lb Poodle. She doesn't back down and dishes out more than she takes. The two have formed a strong bond in the week Echo's been here. Kona gives Echo more exercise in an hour, chasing after each other outside, than we can give her in a day. When they tire each other out a bit, they've even been known to lay next to each other in one our large pillow bed. Echo is like those old Staples Office Supply ads - she came with an "easy button" By far the easiest dog to raise as a puppy, and we thought that distinction belonged to Kona. We've been blessed with two great pups in a row. She's 6 1/2 mo and is 14 lbs. ​PS. 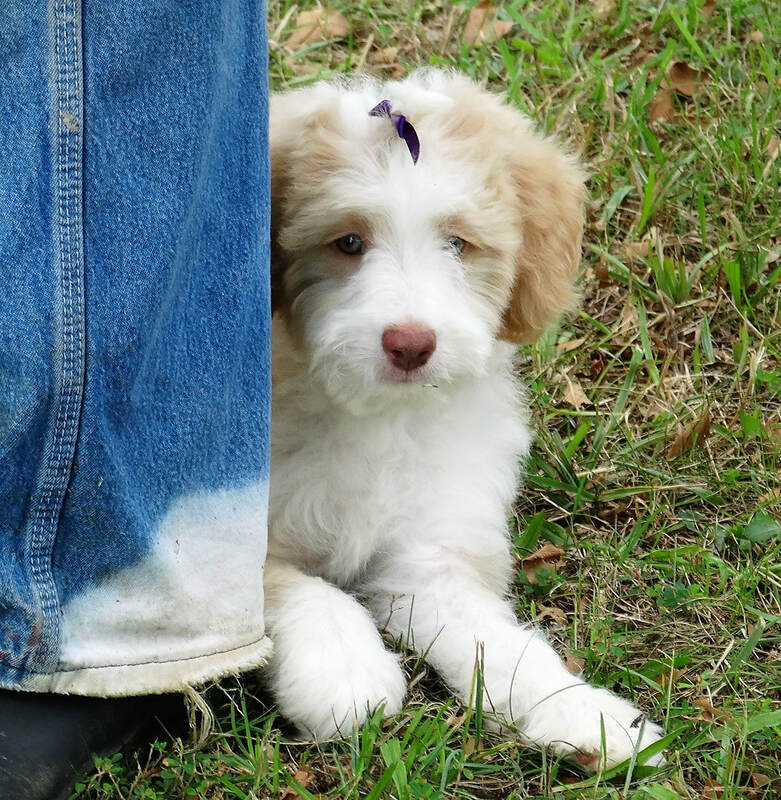 Luna is one of our Aussiedoodle girls from Xenia and Tyndale. Just letting you know that Juno is doing great!! She is very smart and loving. I've attached a pic. She's growing like crazy! 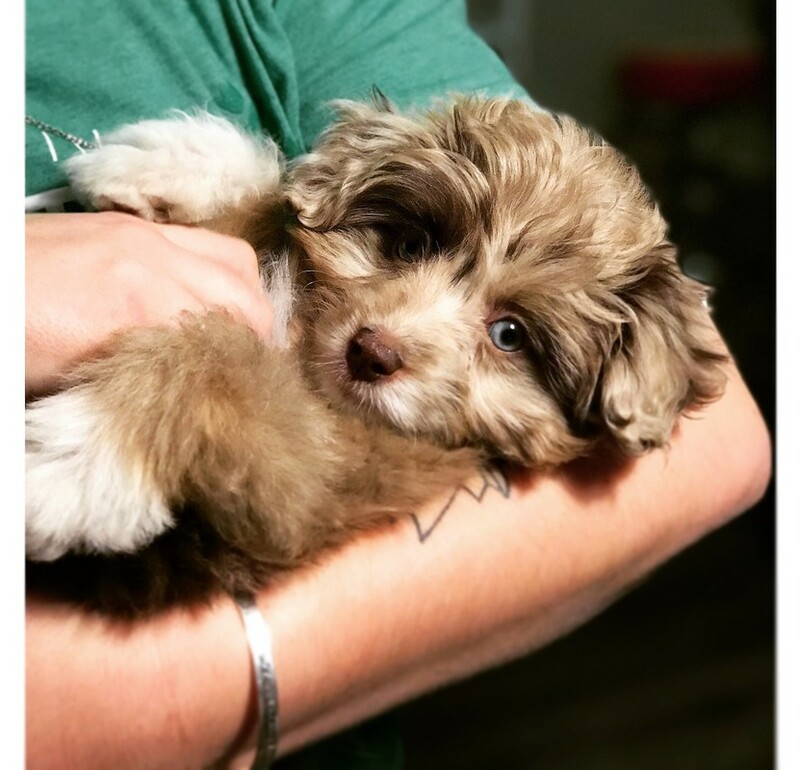 My wife and I recently purchased little Olsen. I wanted to give you a quick update. We are calling the pup Gus instead of Olson, he is growing like a weed and learning new things daily ( some good and some not so good). We are thrilled with our choice and looking forward to many years of fun. I am attaching a picture, he recently found himself in a mirror and is convinced there is another dog here somewhere. We have had Sparky for 6 months now. He is still an ornery little puppy but he is also the sweetest dog ever. He makes me laugh every day with his goofy personality. 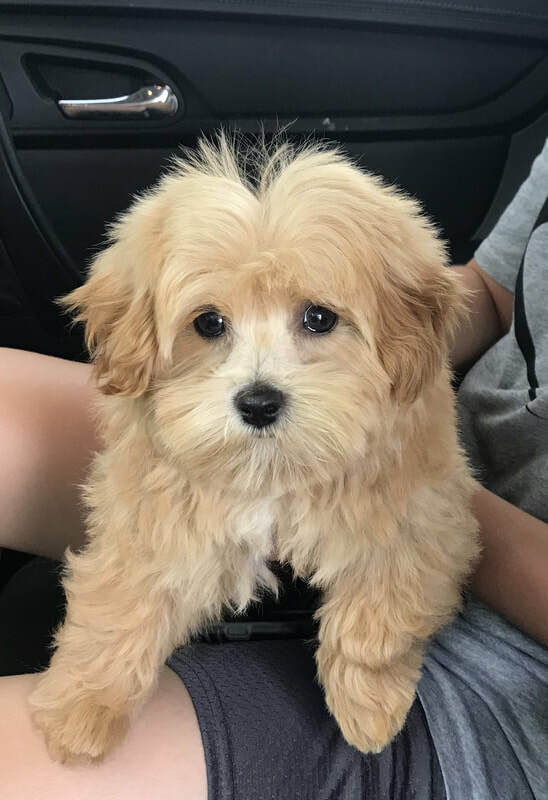 Penny, one of our apricot Maltipoos - now lives in NY with Corinne and her family - she is definitely going to be a happy girl. :o) - Thanks so much Corinne, for sending these pictures. 6/21/17 - Hi Mary Anne! I hope you guys are well. Wanted to send you some recent photos of Audrey! She's such a happy and fun loving girl. LOVES the water and swimming, and loves people . Hi Mary Ann! How crazy. I actually was just thinking about you today and realizing that I should send you an update! Nubble is great. She learned sit, down, and paw. Each trick only took about 5 minutes. It's absolutely crazy how smart she is. She is definitely a ball of energy and can be sassy but she is also the cutest darn thing. She sleeps with me at night now above my head on my pillow. She is beautiful. She has energy galore, so long walks and park time will be consistent for us. She is stunning. Her right eye has remained blue but has developed some green in the top right corner, while the left one has turned completely green. Thank you for her! Here is a picture and a video! 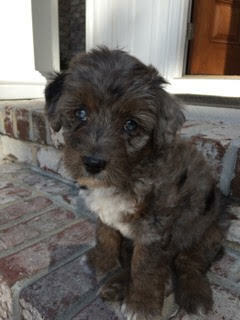 Kona is first gen. Aussiedoodle - now at home with Kelly. "Hi Mary Ann- Kona is doing great. She is starting to settle in and becoming very full of herself. :). Everyone just loves her. She is such a sweet puppy. Zoey (my mom's golden doodle) just loves her as well. They play very well together. 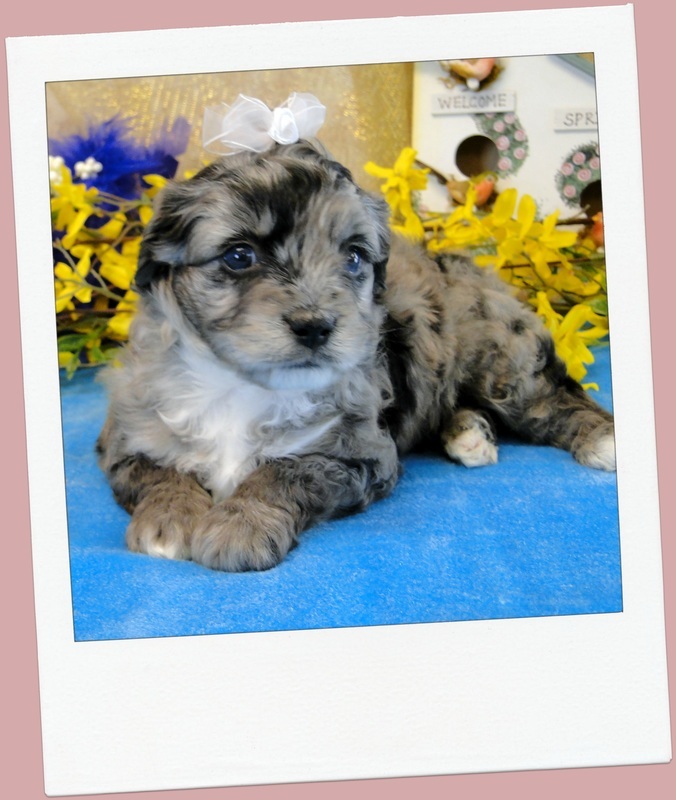 Missy is an F1B Toy Aussiedoodle. She is only about 6 pounds - but less than a year old here - she will not be a big girl. Her parents are Xenia and Tyndale. She gets along great with her 105 # Doberman friend. 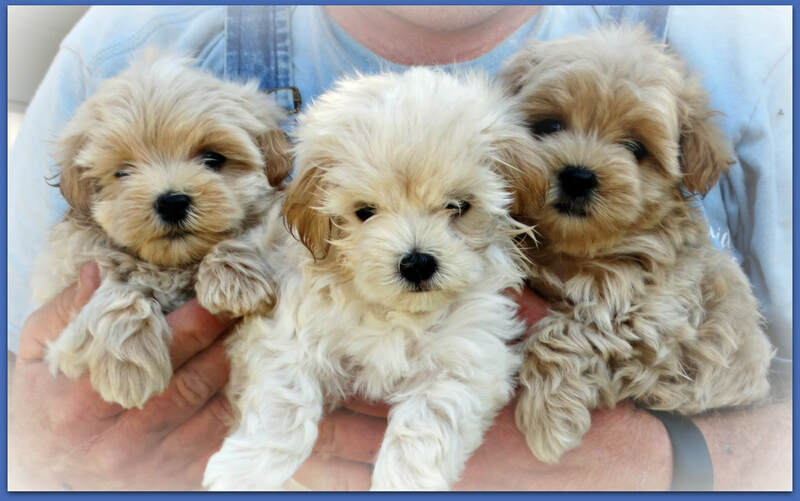 Here are a couple of our apricot Maltipoos. They got to go to the beach with David and Mina - lots of fun!! ​Hi Maryann! I've been so busy these past few days! My parents are absolutely IN LOVE with Adina!!! They cried! They're just loving their new baby and spoiling her. She's doing great with potty training and you can tell she's super smart. Rallie and her are already best friends and play all the time :) It's so cute! Here are just a picture and a movie of them playing that I have on my phone but I promise I'll send more:) take care! I wanted to send you a new photo of Callie at 5 months! She is very happy and knows our routine and we are head over heels in love with her:). 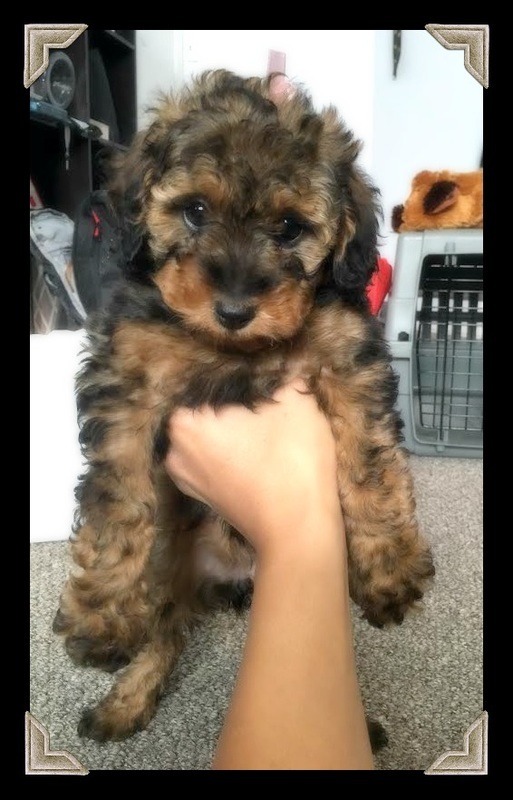 She is scheduled next week to go to puppy grooming class so they can introduce her to the grooming supplies before they actually use them on her. She will go two times then get a puppy cut! Of course I have to share this video with everyone - Jennifer in CA sent this to us - Kooper is a Hearthside Aussiedoodle that she got from us. He is an F1B, from Dora and Barney. 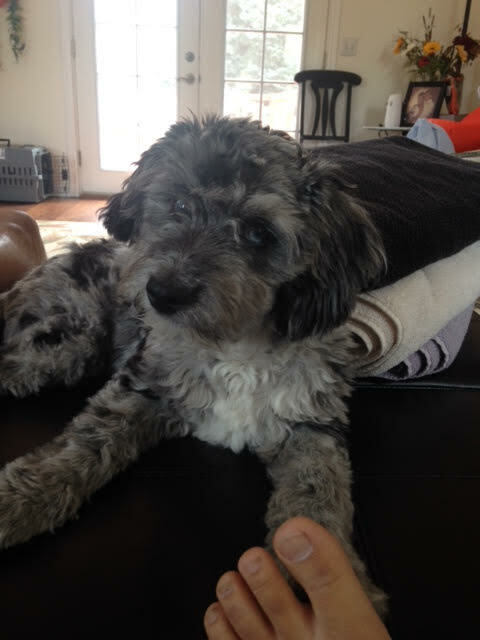 "I wanted to forward you this Video of Kooper (formerly Slade) with a few pictures as well. He is such an amazingly sweet boy, and we love him so much❤️. He's a head turner. Thank you for doing such a great job! There are more pictures of Kooper in another video on this website. Click to go and see. It's been a while since I've last spoken to you. 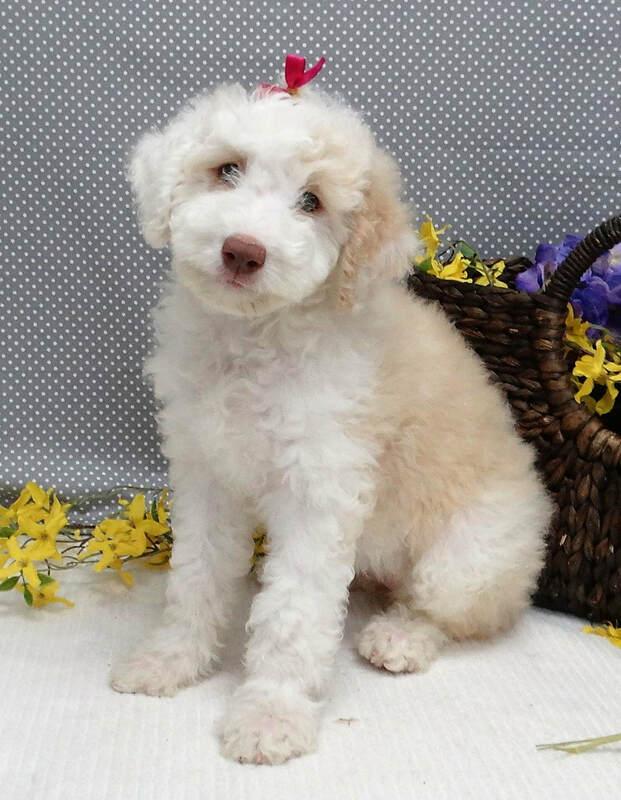 I've been looking for a puppy for my parents. They absolutely love Rallie, I believe she came from your second litter of aussiedoodles from Freedom and Coral. 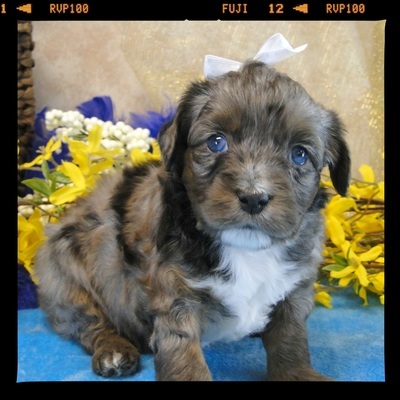 Since they loved Rallie so much I know they'll love an Aussiedoodle of their own. I've been watching your newest litter of aussiedoodles and I'm really interested in bringing home miss Baker, the black tan girl. Is she still available? I still think her colors are gorgeous:) The care and love you gave her before she came home to us has really played a fundamental role on the type of dog she turned out to be that is why I'd love to bring home Miss Baker. We're still in Utah. 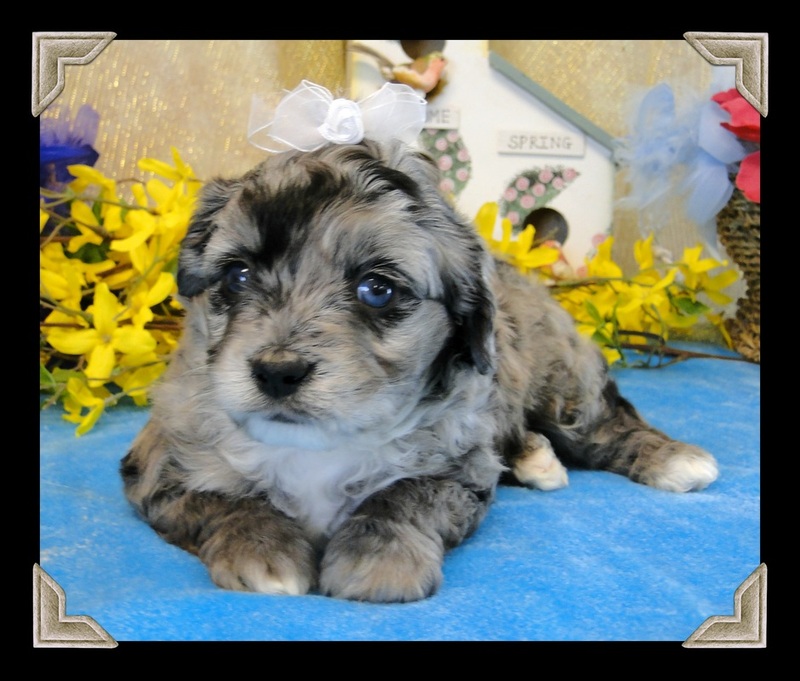 Please let me know if she's still available. Hi Maryann, Melissa Here, Marley's mom. I have a friend who is looking for an Aussiedoodle, and would like to know if you have any litters coming up. We did look at the website and saw the Toys. He saw a blond one in the top right pic hiding in the back, but we didn't see a picture of him/her solo. My friend Patrick wants a boy, and he also really likes the merles. Either Marley size or a toy. This note came from Katie in AR. Buddy looks so adorable in the picture she sent. 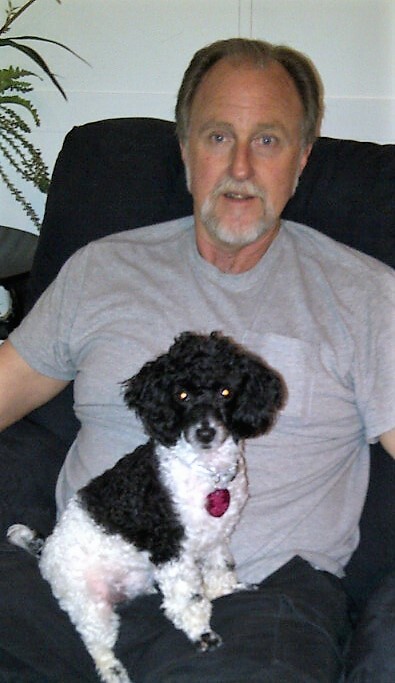 :o) He is a first generation Aussiedoodle. "Just wanted to let you know that Lassen (now Buddy- boys named him) is doing great! He is so smart and just the sweetest dog ever!!! We Love Him!" ​"Hello, I just had to share this with you. We recently had to go to Denver for our grandsons 1 year old birthday. Our house sitter (Brian Alich) posted this photo on Facebook with the question, "where do you keep your meat cleaver?" Lol, He's up to 6.5 pounds and doing great!" 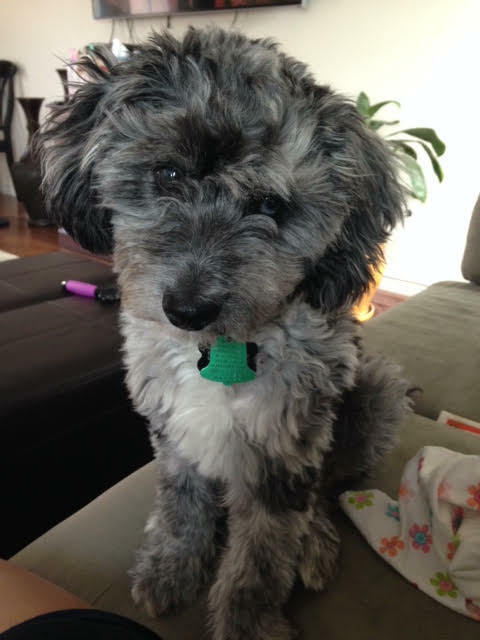 "Sal, just shy of 16 weeks...This video shows sit, down, stand, rollover, and fetch. We are also working on stay, take it, and off among several other things. He has become a much better walker over the past few weeks due partly to treats and also the use of a Gentle Leader Head Halter. When we hike on trails, he is a perfect walker...he even makes sure that we all stay together! Since his third day at our house, he has rung the potty bell and has had a total of only 3 accidents. He does not enjoy being brushed/combed/bathed/teeth touched but somehow we manage with treats. Overall, he is a smart, sweet puppy." We love our Berry! He's doing great! He's so calm but when we took him outside he was chasing us around and playing! We got the papers from the bottom too. Thank you much! We will keep you posted! "The kids are in love with Flash! I've attached an image of my daughter and him." I think Mayli is an amazing photographer. Our sweet Dolce' is already a Mirabella! We picked her up just Saturday from the Nashville Airport and immediately fell in love! Coincidentally we had already set up for family pictures after our sons proms the same weekend, so we have a great family picture with our new "daughter"! Dolce's intelligent factor is unmatched. We are crate training her and she is excelling beyond all expectations! Thank you for handling her and getting her acquainted to sights and sounds, she isn't scared of anything. She loves everyone and doesn't mind being held. Dolce' made lots of friends on her flight home. Passengers marveled at her so much that when I arrived to pick her up, it was passengers that told me where to find my exquisite puppy. 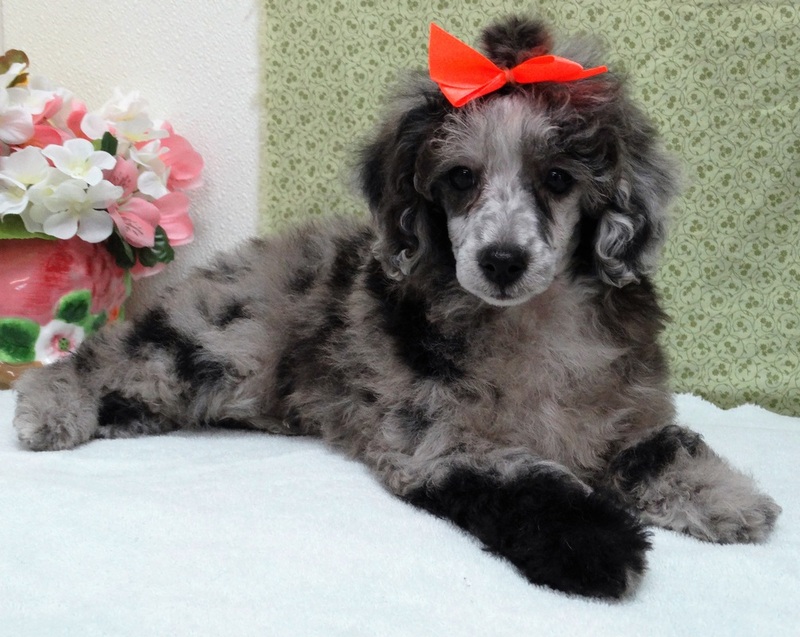 We will send you updates as she grows from a delightful girl to a beautiful young lady. Jo is doing great! Man she is smart. 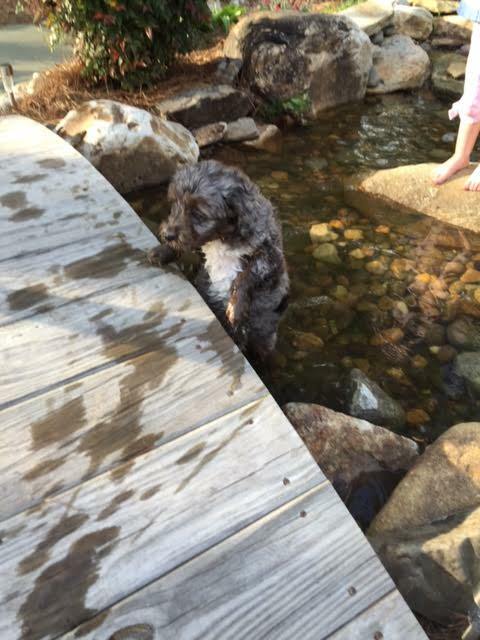 My schnauzer is smart, but Josie is a whole other level of smart. She is fearless too. She gets to playing with Jemma and gives as good as she gets. She also let my big, outdoor neutered tom barn cat know she was not scared of him! She has had a couple of accidents in the house. I have caught her each time and I think, as young as she is, she gets it. She is now letting me know when she needs to go out. She was super whiney when she first came. Which I understand. If I left the room, she panicked and screamed. But it was all new to her. She has calmed down considerably. Jemma fetches a ball I throw. I never taught her to do this, she just picked it up. Josie is now running after the same ball and Jemma, sweetheart that she is, sometimes lets her get there first. Jo picks up the ball and and prances around with it in her mouth. Question. I was a groomer and dealt with tear stains. But you are breeder and have shown. Any tricks that you know? If you ever need a reference, send them to me. I will be happy to tell them how great she is. Aspen has been doing so well. Her and Willow adore each other :) thank you again. Happy Holidays to you! I hope you and family are doing well, and that all your pups are, as well. 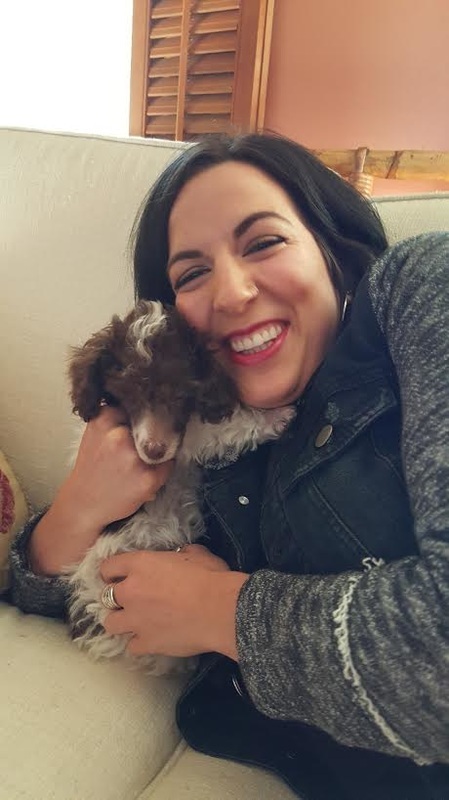 I just wanted to let you know that my puppy Lily is a very loved new member of our family. During the 9 months that she’s been with us, she has brought so much joy to our home. I’m sending along some pictures to show you just how much she has changed. She has a lot of the ash coloring, especially on her legs and face — really beautiful! She weighs about 27 lbs., and she’s so smart. I’ve worked with a trainer, and she can sit, lay down “dance” for treats, and she takes long walks with me everyday. I’m hoping to get her involved in agility training next year. She loves people and being with other dogs. What a great companion! It’s so funny, I guess it’s the herding instinct — she likes to have everyone in the same room all the time. My son Blake stays with me on the weekends and if he’s in the basement, she just lays down right by the stairs so she can see both of us. Anyway, I hope you can tell how pleased I am to have Lily in my life. I’ve referred Hearthside Country to several people in the past few months, because everyone wants to know where I got my dog. Thank you for taking such good care of her as a tiny baby and getting her ready for me. 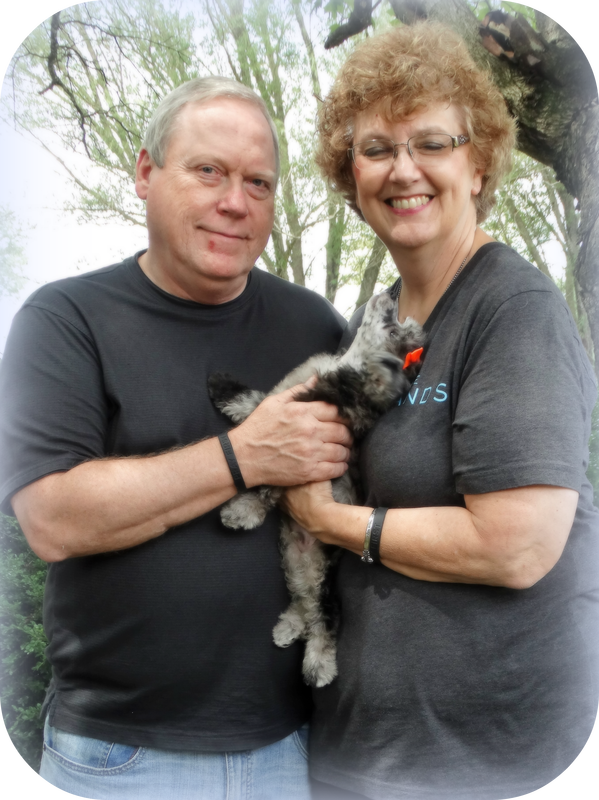 I just have to tell you how amazing Hazel is and what joy she has added to our lives! She has settled in and we all feel like we have always known her! Not only is she exquisitely beautiful but she is funny affectionate and has an amazing personality! Our older dog Max had some adjustments to make but now they are playing so much that he lost a pound and a half since she came! He is a little overweight! If you have any pictures or videos of her when she was firstborn we would really appreciate it! 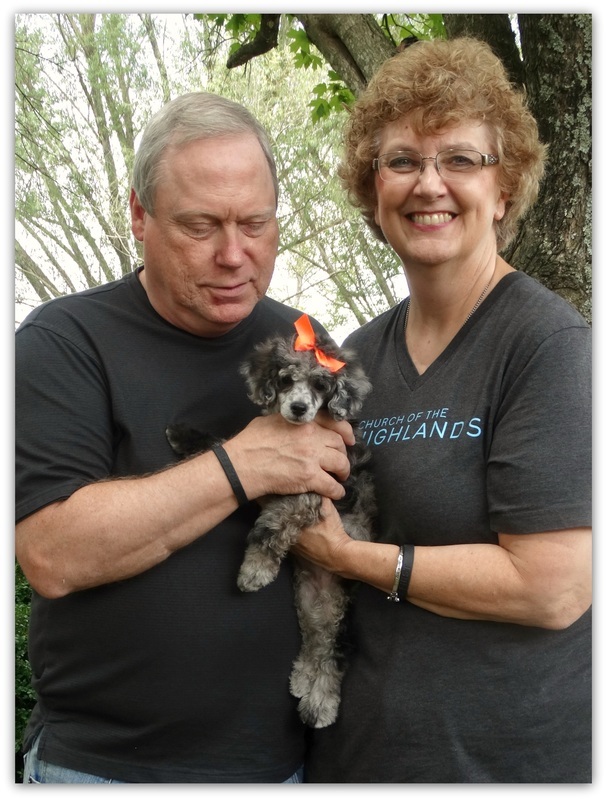 We can't believe how fortunate we were to find you and Hazel!!!! Just wanted to let you know all is well and Tucker is loving his new home. He such a wonderful dog! Still learning the potty outside but he's catching on! We keep pretty busy and he loves going to my parents to play with the other family dogs. Hi, Mary Ann. I've been thinking about you and wondering how you are. We are doing well and I wanted to send you a picture of Sweet Pea's puppy class graduation from a couple weeks ago. She did really well every week -- very calm and observant when all the other puppies were crazy. Lol! We hope to start a second class in November. Last week she weighed in at 7.2 lbs when we took her in for her rabies and distemper shots, so she's still a little girl -- but sweet and a stinker. She's almost house broken, gives lots and lots of kisses and loves to play with True. In fact, they have the best time together and make us laugh at the funny things they do. Monkey see monkey do is probably the best description. Now that fall is in full swing, she loves to pick up a leaf and carry it in her mouth for walks. It will be interesting to see if she likes winter as much as fall, since she's a southern girl. We love her very much and are so grateful to you for letting us get her when we did. Lillie loves having her sleep with her and snuggle next to her on the couch when she's reading or doing homework. Thank you so much. I have been and will continue to pray for you and your family. "Hi Maryann, Can't see it that great but one of her eyes is mostly brown with some blue specks in it and the other is mostly blue with brown specks in it. She's a cutie:)"
Mary, Thanks for checking in. We absolutely love this girl as her personality is just so wonderful, she loves everyone and every dog she meets. 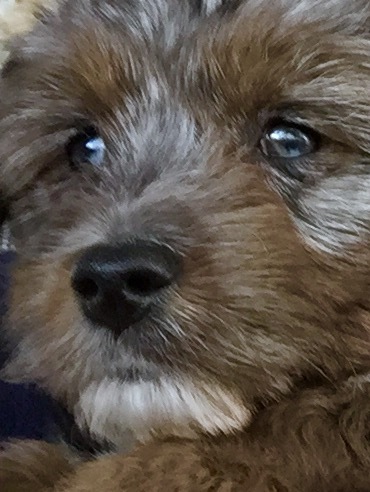 He eyes have turned out to be about 1/8th blue….small spots of blue on each iris. 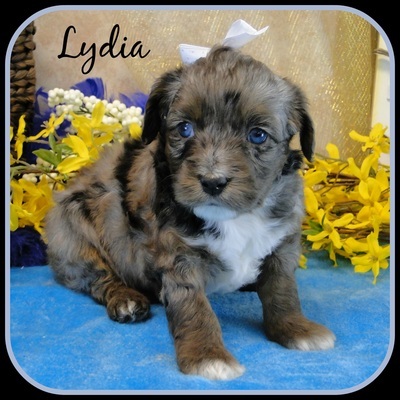 We were hoping for all blue as our other aussiedoodle but her personality far out weighs the eye colour. Great job on the breeeding process. I've been meaning to email you to let you know how Simba is doing. Right now, he is running around our backyard burning off some energy before we go to bed. He really loves to chew leaves, it's pretty cute. The family loves him! He is a little ball of energy and loves to be held and petted. He's definitely teething so we try to give him toys and rawhide to chew. He's up to date in his vaccinations, eating well, and overall happy. When we take him out, he's always receives compliments on how cute he is and people ask what type of dog he is. He is quite the popular little boy! I've attached a picture of him with our older daughter from last week. Our deepest thanks to you again -- what a wonderful blessing! We arrived home safely around 9:30 and no extreme fatigue -- thank you for your prayers. I hope you arrived home safely too. Lillie decided on the way home that she was so sweet that she named her Sweet Pea and we'll call her Sweetie for short. About an hour from KC, we stopped for a potty break and she did a good job. In fact, she did well all the way home. I took her out at 11 last night and again at 3, and she went both times. She slept quietly through the night and went both pee and poop this morning. She ate just a little bit this morning and just wants to snuggle or sleep, which seems normal to me as she adjusts to her new life and us. Hi Mary Ann here is a picture of Clem about 5 days ago in his sailor suit lying on his " claimed" tiger rug he just decided was his. He currently stands 12 inches at top of shoulders and weighed 8.9 lbs. 3 weeks ago at the vet office. I think he's very happy here and we have a lot of fun with him he's got quite a personality. Thank you for such a wonderful dog!! Thank you for sending the pictures. "Samson we think that's what we will name him" is doing very well he slept thru the night in his kennel didn't make a sound or a mess! He is getting the hang of how to heal on a leash and knows sits and shakes on command he is a very very smart little boy! He is so much fun to have around everywhere we go he gets a lot of love and compliments about how cute and soft he is. He is adjusting very well Gabby and I love having him around. Here is a picture and video that I took this morning. Hope you have a wonderful day it was a pleasure to meet you and your husband." Meeker's birthday is in a couple of weeks so I thought it high time I let you know what an absolutely fabulous dog he is. He is so well behaved and connected to all of us. Loves being outside and going to the park and playing with any and all other dogs. And at home he is happy chasing a tennis ball or cuddled up on the couch (he prefers the cushions up on the back of the sofa just like a cat). Everyone who meets him thinks he is just the cutest dog going - even friends who are generally not animal lovers. We can't thank you enough for breeding just a sweet little boy. 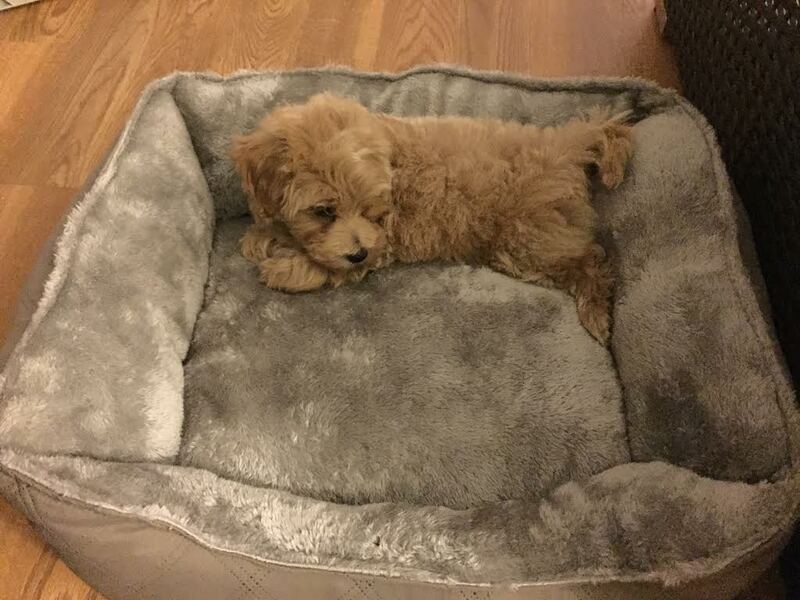 By the way he is still only around 6pounds. Very active but not a huge eater. 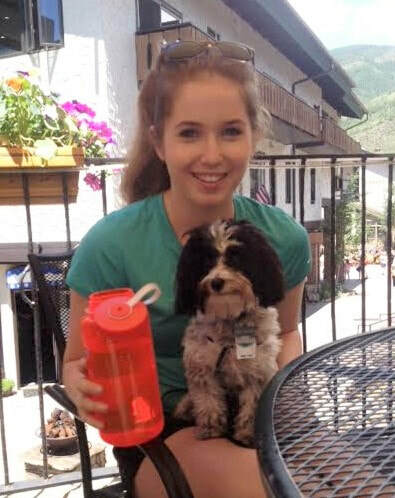 The picture attached is from July with Jackie in Colorado.